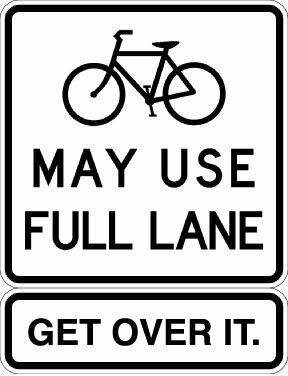 Colby Asked: Concerning the Bicycles May Use Full Lane signs, is this actually Florida law as stated on the street signs? I am familiar with the MUTCD but not these particular signs. If so, I am unclear on how the 3-foot passing law correlates with a “full lane” for passing. 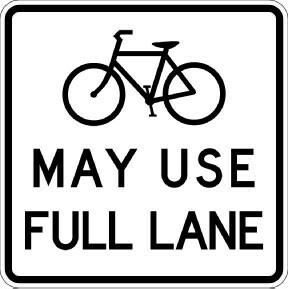 The Jan. 2009 revision of the MUTCD includes the Bicycles May Use Full Lane signs, as well as Sharrows, which are road markings that encourage sharing the lane. They were not in the 2003 version. It will be formally adopted by FDOT on Jan.1, 2011. In the meantime, they are revising their documents to reflect the changes. When the BMUFL signs are posted, the statute that requires compliance relates to the requirement to obey all traffic control devices. The 3-foot statute is not linked in any way to the use of the full lane. It is always the absolute minimum safe passing distance, no matter what the lane width might be. We shouldn’t rely too much on that, since most motorists will already give more than that if we ride correctly. The use of the full lane is predicated on lane width. Narrow lanes which are not wide enough for a motor vehicle and a bicycle to safely travel side by side within the lane are substandard-width lanes, and are unsafe conditions that allow cyclists to leave the right-hand curb or edge of the roadway. There is a full discussion of that at Substandard-Width Lanes. 1 Pings/Trackbacks for "Bicycles May Use Full Lane"